Final Cut Pro X celebrates its fifth anniversary this summer, and while the reimagined video editing software has come a long way since that rocky debut, the application’s use of libraries—a package containing projects, events, media, and render files in one convenient place—continues to be an enigma to many users. That’s a shame, because Apple’s implementation of libraries actually makes media management easier for the most part, especially when it comes time to copy or move projects to another Mac, or archive after delivery. Many editors frown upon the way FCPX keeps media behind a veil of secrecy, rather than entirely within their control like Final Cut Pro 7 and earlier. 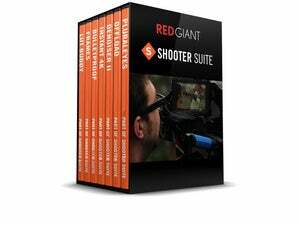 Power users already know there’s an easy way to see what’s going on behind the scenes by clicking on a library with the Control key held down and selecting Show Package Contents, but it turns out there’s a much more sophisticated way to do this and a whole lot more. Overwhelming user interface aside, Final Cut Library Manager 3 is a must-have utility for any Final Cut Pro X user. Final Cut Library Manager 3 (€23) is Mac utility software that sheds light on what’s inside your Final Cut Pro X libraries, offering a comprehensive look at all of your projects from a single place. FCLM uses the Spotlight index data on your hard drives to provide a bird’s eye view, even when media files are stored outside the library. The result is an extremely nimble application that displays information far quicker than opening the same library in FCPX. If you want to read/modify notes, view, search, or otherwise manage the contents of a library without doing actual editing, FCLM is hands-down the fastest solution, with a dark user interface that nicely complements FCPX. The sheer volume of information displayed can be overwhelming at first, but it’s quite easy to use. At left are source volumes, which includes mounted and offline drives as well as any folders you’ve added. If a volume hasn’t been indexed yet, FCLM can add it just by dragging it onto the list from the Finder. The rest of the window displays your FCPX libraries, which can be sorted by total size, when they were last modified, or the amount of cache space used. A fuel gauge next to each item shows the content type; hovering the mouse over one reveals a breakdown of its contents. 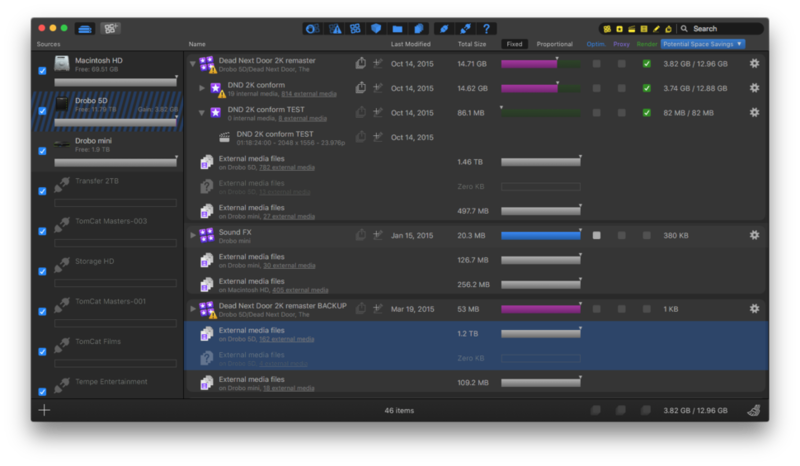 Green is for render files, purple for optical flow data, or blue for optimized media, all of which are safe to purge since these files can be easily recreated in FCPX; original media in gray are for display only and can’t be deleted using FCLM, but this is by design. Click the gear icon at far right to reveal all of the ways you can interact with FCPX libraries. Although previous versions were paid-only, the developers chose to go with a freemium approach for Final Cut Library Manager 3. The core application is now free, but limited to view-only access; an Advanced license unlocks all functionality from previous versions, including the ability to create templates from existing projects and clean libraries. This is what originally enticed me to buy the software since FCPX makes it more difficult than necessary to identify and eliminate cache files before archiving. By comparison, FCLM gracefully handles this task: Check the desired optimized, proxy, or render columns, click the broom icon in the lower right corner, and you’re done. Editors can even select caches across multiple libraries to purge everything with one click. A pair of optional upgrades are available for €3 each: One adds the ability to duplicate, move, or delete libraries (free for those upgrading from a previous version) while the other provides a shortcut to media you’ve exported from FCPX. I didn’t find the latter appealing enough to upgrade, but the former is exceptionally convenient and much faster than firing up FCPX to accomplish the same tasks. There’s still room for improvement. The user interface is better organized, but the sheer number of buttons can be daunting. The biggest limitation is you can’t view events within libraries at all, which would come in particularly handy for printing the contents as a hardcopy or exporting to PDF. 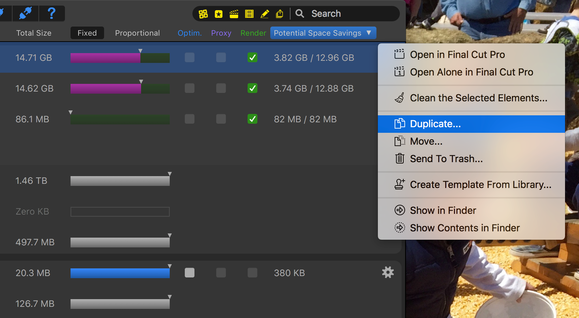 For a modest upgrade fee, Final Cut Library Manager 3 can duplicate, move, or delete libraries without opening FCPX. The ability to clean libraries alone makes Final Cut Library Manager 3 a must-have utility for all Final Cut Pro X users, and the new duplicate/move/delete option should be considered an essential upgrade. Final Cut Library Manager 3 displays detailed information on all of your Final Cut Pro X libraries. With a paid license, the software can also perform much-needed housekeeping chores such as cleaning caches.